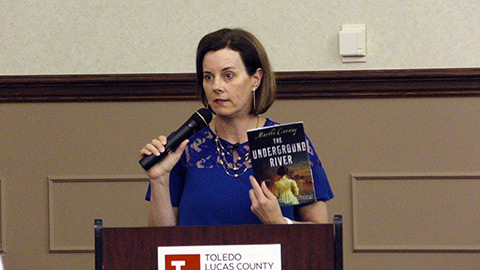 Martha Conway discussed the newest novel in her Ohio Trilogy, "The Underground River." The lecture was part of The Lucas County Public Library’s Open Book series. Martha Conway is the author of several novels, including Thieving Forest, which won the North American Book Award in Historical Fiction and an Independent Publishers Book Award. It has been called “extraordinary” by the Akron Beacon Journal and “hypnotic” by Kirkus Reviews. Her first novel was nominated for an Edgar Award, and her short fiction has appeared in the Iowa Review, Mississippi Review, The Quarterly, Carolina Quarterly, and other publications.